Like Partridge's portraits of Lord Aberdeen (NPG 750), Lord Melbourne (NPG 941), and Lord Palmerston (NPG 1025), this portrait is closely related to the figure of Macaulay in Partridge's group 'The Fine Arts Commissioners' (see NPG 342), and was presumably painted as a finished study for it. Macaulay is shown in an interior with three books of Dante's Divine Comedy on the table behind him, an indication of his lifelong interest in Dante. He is holding a book of illustrations to the Divine Comedy by John Flaxman, the illustration which is visible being that to Canto 21 of The Inferno, concerning 'The Bridge' ('e i diaboli si fecer tutti avanti'). Flaxman's designs were first published in Rome by T. Piroli in 1793, but Macaulay is probably holding the first English edition of 1807, also with Piroli's engravings. Partridge painted all the Fine Arts Commissioners individually from 1844 onwards, and retained these portraits himself, many of which he exhibited at his own gallery, following his refusal to exhibit at the Royal Academy after 1846. At his death in 1872, his executors attempted to sell these portraits to the original sitters or their descendants, auctioning the remainder, including this one, at Christie's in 1874. The sizes of the various studies for the finished group do vary. In the case of Lord Melbourne there was both a kitcat size study (ie the size of this portrait), and a larger one (see NPG 941), and the same appears to be true of Lord Palmerston. There is, however, no trace of a larger study of Lord Macaulay. In the past, the date 1846 has been given to all Partridge's portraits of the Fine Arts Commissioners, and to the finished group, presumably because this was the date of the meeting depicted. It is clear, however, from contemporary evidence that the big picture was still in progress in 1853. 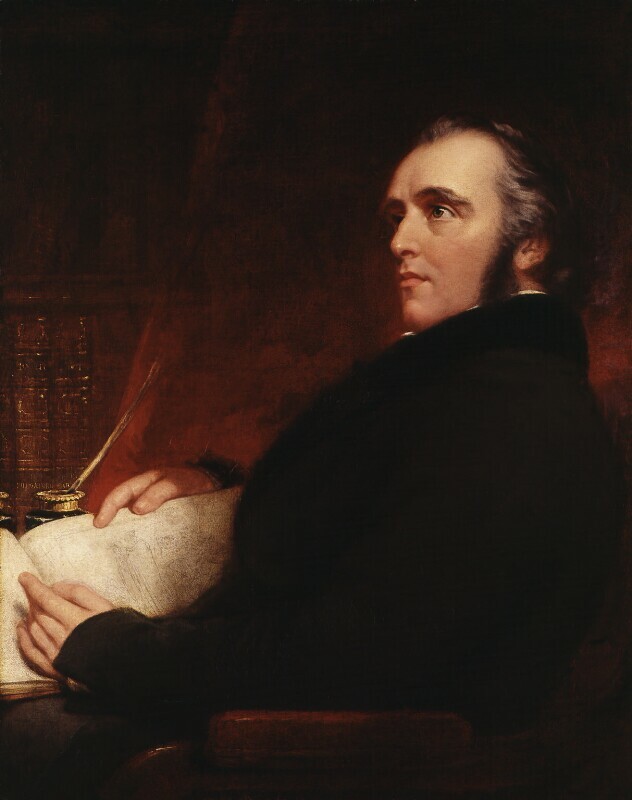 A letter from Macaulay to Partridge, dated 21 February 1849 (NPG archives), informs the artist that he will call on Thursday to sit for his portrait, and hopes one sitting will be sufficient. He also mentions the group and another sitting for it in letters of 30 May 1849 (collection of Dr A. N. L. Munby, Cambridge), and 25 April 1853 (on loan to University of Nottingham), and in his 'Journal' for 26 April 1853 (Trinity College, Cambridge); see entry for NPG 941 for more details of these. A copy of NPG 1564 by A. C. Dyer is in the Victoria Memorial Hall, Calcutta. T. Macaulay, History of England, edited by C. H. Firth (1913), I.
R. L. Ormond, 'John Partridge and the Fine Arts Commissioners', Burlington Magazine, CIX (1967), 401. Fresh complexion, hazel-coloured eyes, dark hair and eyebrows with grey streaks. Dressed in a white collar and dark green coat with black velvet(?) collar. Seated in a chair with red leather covering. On left open book, with gilt and glass inkstand, and a quill pen. Behind two shelves, both with three leather-bound volumes. The rest of the background consists of a deep red curtain. The artist; Partridge Sale, Christie's, 15 June 1874 (lot 69); Viscountess Knutsford, presented by her husband, Viscount Knutsford, in accordance with her wishes, 1910. 'Pictures in Mr Partridge's Gallery', 1851 (copy of catalogue in NPG archives); VE, 1892 (209). T. Macaulay, History of England, edited by C. H. Firth (1913), VII; R. L. Ormond, 'John Partridge and the Fine Arts Commissioners', Burlington Magazine, CIX (1967), 400.